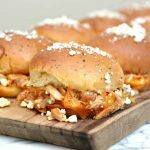 These Buffalo Chicken Sliders are so delicious and easy to put together! With buffalo chicken, cheese and buns covered in ranch seasoning and baked, it’s the perfect appetizer. Add chicken, buffalo wing sauce and 1 tablespoon ranch seasoning to slow cooker. Cook on high for 3-4 hours. Once chicken is cooked, preheat oven to 350 degrees. Spray 9 x 13 baking dish with cooking spray. Use a bread knife to slice the slider buns in half. Place the bottom half of rolls in baking dish. Top each roll with a slice of cheese and chicken mixture. Place top halves of the rolls over chicken. Mix melted butter and 1 tablespoon of ranch seasoning until well combined. Spoon mixture evenly over the tops of each roll. Bake uncovered for 10 minutes or until rolls are golden brown. Sprinkle blue cheese crumbles over sliders before serving. Serve with ranch and blue cheese dressing.